HOPG is an excellent tool for using in scanning probe microscopy as a substrate or calibration standard at atomic levels of resolution. 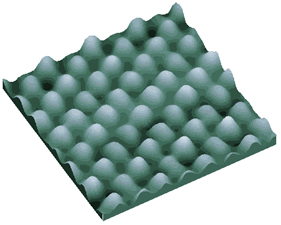 This is an easily renewable material with an extremely smooth, atomically flat surface. This is vital for SPM measurements that require uniform, flat, and clean substrates, for samples where elemental analysis is to be done. Price of HOPG depends on the size and mosaic spread of the sample. The latter term is used to characterize a measure of perfectness of HOPG samples. The lower the mosaic spread, the higher the quality of HOPG and the higher the price. We offer several grades of HOPG. Each grade plates are produced as flat shapes with standard chip size of 10 x 10 mm that come in several different thicknesses. The standard thickness tolerance is ± 0.1 mm. To learn more about HOPG please click here.